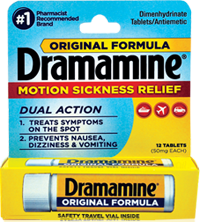 To get a FREE Sample of Dramamine submit a funny/interesting story about experiencing motion sickness during their travels! *This offer is still available. Do you have a funny story or an interesting tip for beating motion sickness in your travels? Submit your stories and you’ll be eligible to receive a free sample of Dramamine®. I am not sure there is really any funny stories involving vomit in a car, but….Once I forgot to give my son his dramamine and he threw up 3 times in 20 minutes.